Zora Murff’s book is a view into juveniles in the justice system. Zora documents these young adults by photographing their environments, their objects and letters. He does in fact photograph them, but keeps them anonymous. We see their overall gestures, a little of their face, but they are some what hidden from us. This action makes us, the viewers, feel as if we are looking into a secret , peeping into their lives without fully accessing it. These portraits are powerful for that reason. These are young men and women who have fallen into this system for many different reasons. This book tries to capture their lives in this situation, allowing us to see them for more than just their ‘crimes’ or actions. Photography in this book, and this subject matter, really puts a mirror back to us as readers. How we judge by photos and what we learned based on photography. What we see in these young people through photography, what does it change in our perceptions on Juveniles or what does it preserve? The cover of the book was a big surprise for me. The subject matter almost can not co exist with this color of a rich blue-turquoise tone. The silver shiny letters, and this color contradict, in my eye, what I am going to see inside this book. he first photo in the book is of a young man on a bicycle. He has his head down on his hands so we only see a little of his face, and his cap. That is the first image we encounter when we open the book. This image tells us so much about both these teens but also about the photographer’s point of view. It is gentle yet not apologetic and ‘sweet’, it is a document of this person in this time and space, yet manipulated by the act of photographing and the need to keep their anonymity. You can feel the relationship between the photographer and them, they are close, yet the act of ‘hiding’ creates a tension between them. 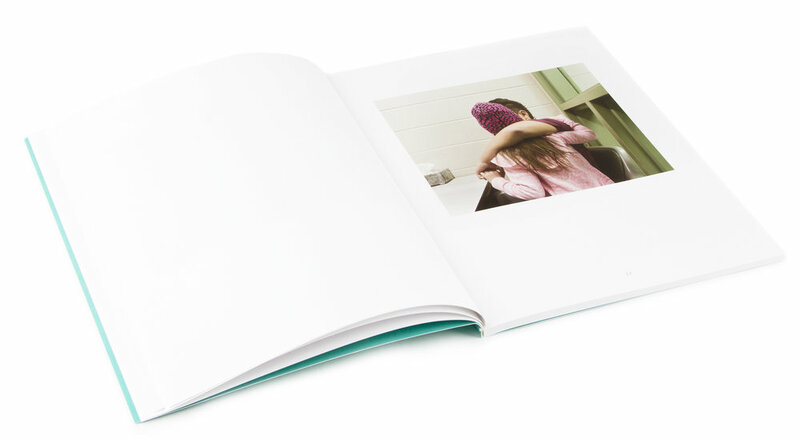 The last photo in the book is a closed door. I found this to be a strong ending, not of hope, but of the reality of the situation. Some of my favorite parts of the book are actually of the still lives and the letters featured in the book. I find that these object tell us sometimes more about the life they are living, their struggle and also hope by viewing their small choices. There is something in a bed that can tell a beautiful story of the person sleeping inside it without us seeing him in it. The text in the book is fascinating because it is truly the only interaction we have with them. It’s the only time we hear their voice, opinion, memories and we are able to understand them better. One text in particular that I found interesting was a ‘check list’ this young man answered. The questions are simple, basic, almost redundant such as “Right now I feel” and “I feel great when”. His answers are what brake your heart. He is honest in these very short answers. In just a few words you feel as if you can look into his pain, yet there is nothing you can truly do about it. I think this book is important in some many levels. It is inspiring as an art/photo book as the images are so poetic and beautifully shot, but more important this is a moving document of people that our society sometimes leave behind, lets down.